Sweden is one of the four countries of the Scandinavia including Norway, Denmark and Finland. It has a population of 9 million people among which 1 million are immigrants according to public sources. In recent years Sweden has been an “Eldorado” of studies for thousands of migrants from around the globe. The country is certainly one of the most interesting place to learn among the countries in Europe and in the Scandinavia in particular. It must equally be commended the fact that, Sweden is among the very few countries in the world, if not, the only to make education completely free. It is calm, peaceful and its citizens are generally welcoming. Though not necessarily an English colony, the second language after the Svenska (official language of Sweden) is English. It is really amazing to know that most Swedish speak good English as well. However, Sweden is certainly not a destination for those who want to come there and look for jobs. The jobs are quite few and those available are often for people who understand the Swedish language. This does not in any way mean that it is totally impossible to have part time jobs in Sweden as a student. The educational system is well organized. Education is tuition-free and most of the things in school, as in most of the country, are highly computerized. This is good though, but, has drastically cut down jobs. Furthermore, even to do photocopies you just slot your card into a machine or enter your code and do your photocopies yourself. Just imagine the number of people who earn a living in the University of Buea or any other university in Cameroon through photocopies. It is completely different here. We hear that the Swedish government is about to introduce the payment of fees but this has not been confirmed by any official sources. It must be said here ahead of time that, the introduction of fees will certainly and drastically, reduce the number of students who will come to Sweden. This is mostly because, unlike in most developed countries, foreign students in Sweden have limited part-time employment opportunities. 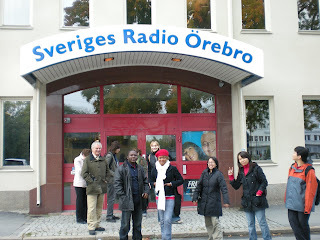 It is really a pleasure and an experience doing an International Masters Programme in Global Journalism at the University of Örebro in Sweden. As Roland Stanbridge Coordinator of the programme posits, those (most) of us who came in as local journalists from our various countries are expected to leave Sweden as international or global journalists. It is under the framework of attaining this objective that the 16 Global Journalism students of the 2008 batch attended the 5th Global Conference on Investigative Journalism which took place in the Month of September in Norway at the expense of the Department I must admit. Several of such trips are earmarked like our trip to Finland in the month of November. The trip to Lillehammer in Norway was formidable from information i gathered from friends since i arrived Sweden late. Though i did not attend the conference in Norway, from the experiences shared by other participants, it was worth attending.